The Chancel Choir is a group of committed singers of all ability levels who lead worship at the Sunday morning worship service each week. If you’ve sung all your life and are looking for a challenge or if you’ve always wanted to sing in a church choir and never felt welcome this is the place for you. 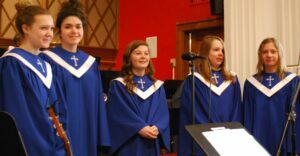 The Chancel Choir is open to ages 14 to 100 and is a group of really great folks who love making music together for worship. Rehearsals are Thursday evenings 7:00-8:30pm. We do a variety of music from traditional/classical to gospel/spirituals to world/contemporary music. Come join us one night and see what all the new excitement is about. Hawthorne Lane enjoys a 4 octave adult handbell choir of talented ringers. We are looking for more to join us – the rehearsal is Thursday evenings at 6pm. Ability to read music is helpful for this group but if you are interested in learning to play and helping to start a beginner adult choir see our worship director and we’ll work together to get one started. Come join in the ringing fellowship! Our praise team is an eclectic collection of instrumentalists and singers who enjoy leading the more recent styles of worship music. We are always looking for new folks to join in the fun so whether you play a flute, a banjo, the guitar or anything else come check us out. We meet Wednesday evenings 6:30-8:30pm. We practice consistently throughout the year and play for worship about once a month. 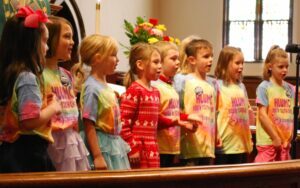 Choirs are offered for kids 3 years old through 5th grade. 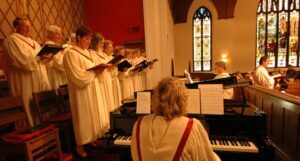 Choir sessions are offered each season, one in the fall and one in the spring. Rehearsals are on Wednesdays from 5:30 – 6:15pm. Kids are involved in learning great music, leading worship, and having fun with their friends! We teach music as a gift from and a way to worship God. We believe that even the youngest worshipper can lead us in praise of God on Sunday mornings! The youth choir has been reinvented this year! It is for grades 6th-12th, girls and guys, all types of voices. We are singing some really relative, authentic music…pieces that get to the core of who we are and why we believe. We plan to sing for worship on occasion, create a name for ourselves, and possibly take a trip or two. If you are interested we definitely want you to come check us out. The youth bells is a new group of young ringers learning to read music and play handbells. They are 4th grade through 12th grade and are learning to play all types of bell technique, notes, and rhythms. Rehearsals are Wednesday 4:45-5:30pm and snack is provided for those walking over from school. All are welcome to join in and learn even if you’ve never done it before! We are always looking to dream more creatively about our worship arts at Hawthorne Lane. If you are interested in liturgical dance, have fine or performing arts talents, or are gifted in the area of graphical design we’d love for you to come join our team. We love to involve all artistic areas in our praise and celebration of God each Sunday morning. Come bring your gifts and share!